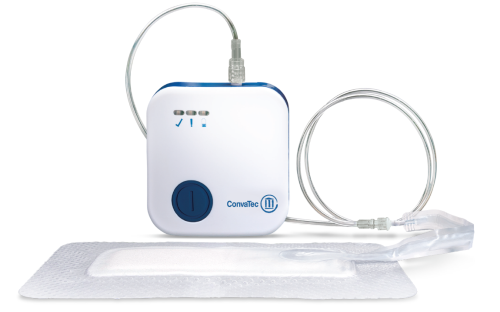 The Avelle™ NPWT Pump is a disposable single-patient use NPWT pump with up to a 30-day lifespan. Delivers continuous negative pressure of 80mmHg (+/- 20mmHg) to the wound bed. Single button operation. The Avelle™ NPWT System is indicated for use on patients that would benefit from a NPWT device as it may promote wound healing via removal of exudate and infectious materials from low to moderately exuding wounds, such as: chronic wounds (e.g., leg ulcers); acute wounds; subacute and dehisced wounds; traumatic wounds; flaps and grafts; surgically closed incision sites. Avelle™ NPWT System is suitable for use in hospital, post-acute and home health environments. • Patients who are sensitive to, or have known allergies to, silicone/acrylic adhesives, sodium carboxymethylcellulose or nylon. • Malignant wounds (wound bed and/or wound margins) (except in palliative care to enhance quality of life). • Wounds with confirmed and untreated osteomyelitis. • Non-enteric and unexplored fistulas. • Necrotic wounds or wounds with eschar present. • For emergency airway aspiration. • Pleural, mediastinal or chest tube drainage. • Burns including partial-thickness burns. Refer to Instructions for Use. Supplied in separate pump and dressing packs. 4.7"x8.3" (1.6"x5.1" pad), 4.7"x12.2" (1.6"x9.1" pad), 4.7"x16.1" (1.6"x 13" pad), 6.3"x6.3" (3.2"x 3.2" pad), 6.3"x8.3" (3.2"x 3.2" pad), 8.3"x10.2" (5.1"x 7.1" pad), 10.2"x10.2" (7.1"x7.1" pad).